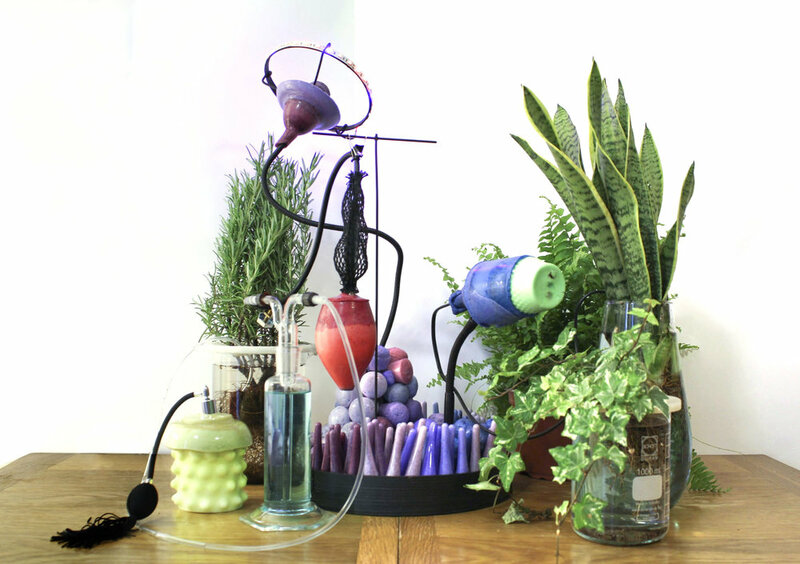 CREAPLANT are Series of Performative Objects that explore layers of symbiosis between humans and plants. The project looks for new approaches on how plants can be integrated in different scenarios, from an office environment to a therapeutic use. The project explores layers of relationship between humans and plants. The idea is to look for new ways to integrate other living organism in our day to day life. This interaction should be beneficial for the user and for the the living system. This interaction shows a positive human activity, a transformation and a positive feedback of the plant as well as for humans. My aim is to reinvent our relationship with plants - This object includes a series of delightful of artefacts, almost like beacons. Each of this objects has an specific role associated to human behaviours and plants, they are performative objects. There are four main interactions. The first one is a watering system, you pump air, release stress, you give water and nutrients and the plant produces oxygen. Second one is a sculpture device, by shaping the cable you can sculpt the plant by turning on the red and blue led light. The plant is able to reconfigure itself towards the light and producing oxygen. Electro stimulation is the third interaction. Is proven that small shocks to plants make the plant grows faster. The project speculates a future scenario where human engage with plants as intelligent beings, what if we could go a step further and messages can be sent through the air by releasing chemicals molecules? Through my research I came across with a lot of research done around chemical exchange between plants and its consequences for agricultural purposes. But not much in the interaction between humans and plants. A research field focus on human-plants exchanges can open new possibilities not only for healthcare but provide new ways to perceive and experience nature. Creaplant is acknowledging plants as intelligent beings that are able to change the properties of the air that can affect and improve our human capabilities and behaviour. Some recent research papers suggests that plants can release some compounds that are similar to the one we use for medical purpose, Can we harvest them? could living plants have a much broader impact on our lives than expected?